Our Saguaro produced flowers for the first time in its life this year - quite an achievement because it takes as much as 35 years before a Saguaro is old enough to flower. We'd written off any chance flowers this year once it hit mid May, so it was a surprise to see the buds develop so late. Many more mature Saguaros already had many buds and some flowers by early May, before ours even showed any signs of buds. 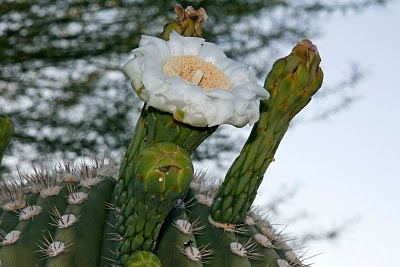 As it stands, it looks like our saguaro may produce about 7 flowers this year. When its more mature, we should expect 20-30, and when it gets arms, 20-30 more on each arm. It will be interesting to see if our Saguaro gets pollinated or not. In our neighborhood, there are only a couple other Saguaros old enough to flower, and none in the nearby desert (most of the nearby desert is actually farmland or cleared for development). The next closest saguaros are a mile or two away in some of the shopping areas. 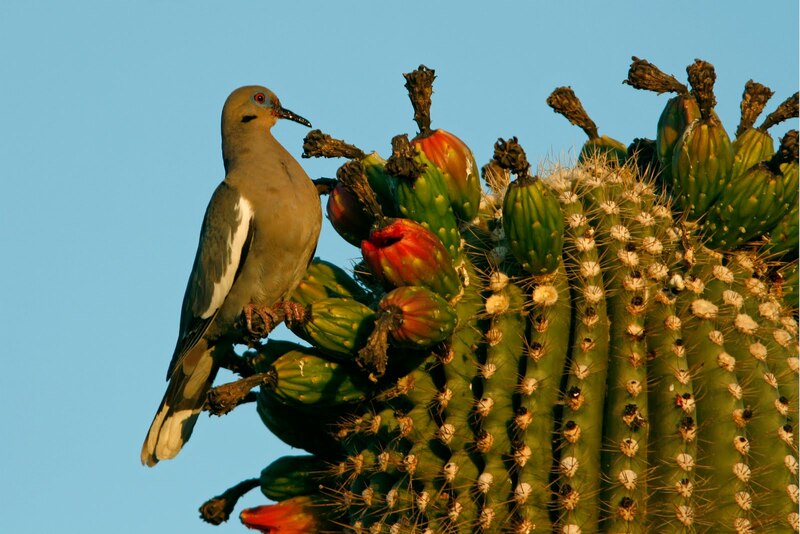 Additionally, Saguaros require cross pollination, and further compounding the pollination effort is that the flowers only last about a day. Flowers tend to open at night, and rely heavily on bats for pollination. We do see an occasional bat in the neighborhood, but I've not taken the time to identify them and determine if they are the species that are most likely to pollinate. The fruit produced after pollination is a bright red, and enjoyed by many birds (especially white-winged doves as in this photo I took a few years ago). Each fruit has thousands of seeds. Our cactus has been in the ground at our house for 3.5 years, and was planted at a height of around 7.5 feet. Currently, it is close to 10 feet tall.